Oops - we don't appear to have a video for the WorkForce DS-770. With an industry-first slow mode1 for scanning crumpled or fragile documents, the ability to scan challenging media has never been easier. The Active Separation Roller System prevents tedious document double feeds ensuring every piece of paper gets scanned and the Double Feed Detection Skip (DFDS) function means you can scan difficult media like envelopes or documents with post-it notes. Auto Scan Mode enables the processing of a vast number of documents as manageable amounts, enabling them to be scanned as one file. High-speed USB 3.0 with TWAIN, WIA and ISIS drivers for enhanced compatibility with Document Management Systems. 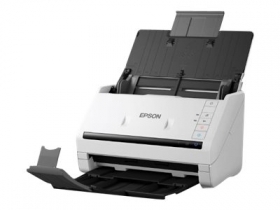 Epson Scan 2.0 software makes it easy to edit images with features such as de-skew and auto rotate, while Document Capture Pro is the easy to use solution for capturing and storing electronic documents at the touch of a button.